Howdy! I’m Patty, a professor of Psychological Sciences at a small college in the midwest. Some important background information: I’m absolutely obsessed with peanut butter. It’s gotten to the point where I can’t keep any sort of nut butter in the house, or I’ll enter into a nut-butter-induced-fugue-state…within a few hours, the nut butter will have miraculously disappeared. So I was particularly excited that Rosa gave me this opportunity to review a free sample of Peanut Hottie, a new hot peanut butter drink. The product is already available in the UK, and it will be hitting the US on September 7th. Peanut Hottie is a powder that you dissolve into hot water…it’s that simple. When it launches in the US this fall, it will come in two flavors: peanut butter (what I sampled for this review), and peanut butter & chocolate. It’s made with real peanuts and is caffeine free. As soon as I opened the jar, I was hit with a sweet peanut-ish scent, really reminiscent of Nutter Butter cookies. The powder is fine-grained and off-white, and each jar of Peanut Hottie contains about 13 servings. 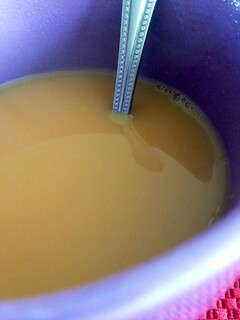 The instructions recommended 4-5 heaping teaspoons of powder per mug of hot water, so I put 4 really heaping teaspoons in about 10 oz of hot water. The powder completely dissolved in a matter of seconds. There was no grittiness, and the texture of the drink was very smooth. 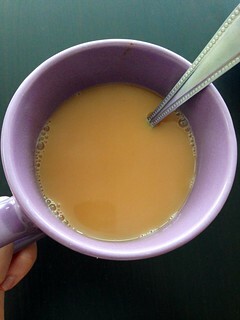 It wasn’t heavy or creamy, and ended up having the consistency and color of tea with a little bit of milk in it. The drink definitely smelled and tasted like Nutter Butter cookies: nutty and sweet (no surprise there: sugar is the first ingredient). I imagine that the smell/taste might be a bit too sweet (and not salty enough) for some people, but I found it to be an enjoyable treat as a dessert drink or sweet snack. 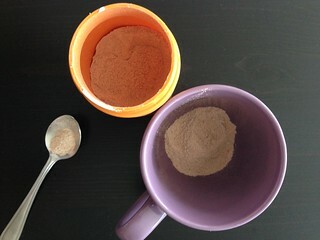 I saw some bloggers use Peanut Hottie powder in their baking, which made me want to explore some “off-label” uses for it. So I decided to try it in a vanilla-chocolate-peanut butter milkshake. It obviously has a completely different texture from peanut butter, but I thought it made a great flavoring for milkshakes or smoothies. It also worked well sprinkled over plain ice cream to give it a little bit of a nutty punch. 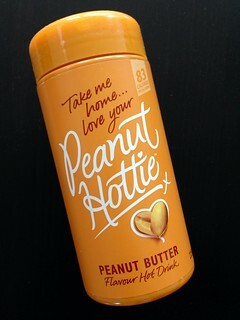 Peanut Hottie is almost definitely a “love it” or “hate it” product. It certainly does not have a natural peanut butter flavor or roasted nutty profile, but do most instant hot cocoa mixes taste exactly like chocolate bars? Heck no, and I’m okay with that. Overall, I liked that my cup of Peanut Hottie was light and nutty, yet still gave me a satisfying dose of sweetness. It isn’t a liquid version of peanut butter, but it’s super convenient and seems to be pretty flexible as a sweet nut flavoring for other treats. I’d give it an OM for normal folks…but an OMG for my own nut-obsessed needs! Disclaimer: I received a free sample of Peanut Hottie from the company to review, but all opinions are my own. Who hasn’t wished for a bathroom made of chocolate?